Nicaragua has many issues, ranging from those that are very large and require massive investments of time and money, to others that involve much smaller and localized problems that are well within the abilities of a small determined group to fix. We have seen the amazing results that a dedicated, hard working group of people can achieve in a week or two, and we know that given the materials and direction they can make a real, visible difference. A great deal of development work requires an investment of time to see results. However, with careful planning and hard work there are worthwhile projects that can be completed in days that will improve the quality of someone's life here in Nicaragua. We know the satisfaction of starting and finishing a project, so you will walk away knowing that you finished what you came here to do. 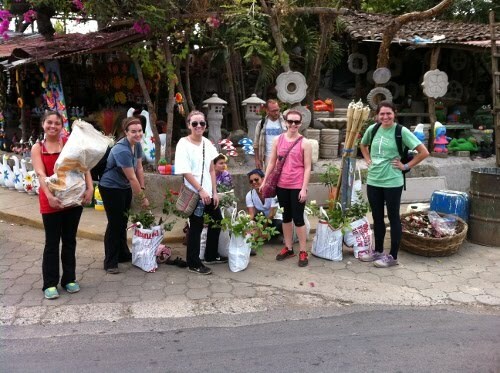 A group from James Madison University delivering plants to a local preschool during their 2014 spring break service trip. With all the groups that we host we carefully plan their project before they get here so that they will fill as much of their time as they want working on their project. We will work with you to design a schedule that will exactly match your requirements and we are happy to organize recreational activities along with the project. We will always provide a realistic goal and timetable in which to get it done. 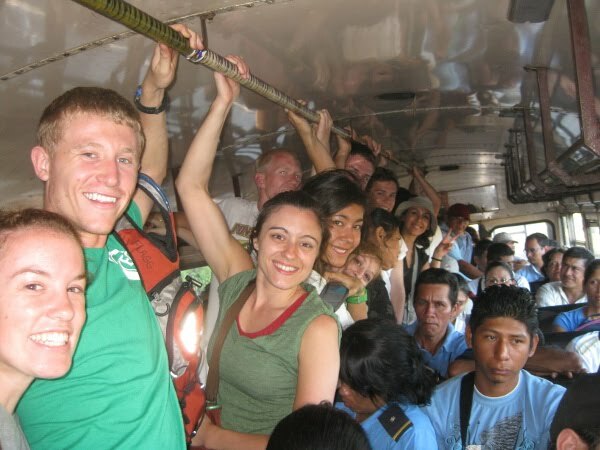 We aim for you to be able to leave Nicaragua knowing that you completed that which you came here to do. The sorts of projects that can be completed in a week or two are usually of a construction nature or some form of manual labor. Examples include painting classrooms, repairing roofs, building infrastructure, repairing infrastructure, fixing school room desks, putting in lights, etc. Institutions in Nicaragua typically have very small maintenance budgets so facilities often go many years without decorations, repairs, and construction work. This can often mean that they lose the ability to use their facilities through lack of maintenance. For example, if there are no lights then school rooms can't be used at night, or if there are no desks then students have to share or write on their laps. Volunteer projects of this nature enable a group to obtain a very tangible result in a short amount of time. If you want to go a little bigger, a number of these institutions need additional rooms, basketball courts, new roofs or other large construction projects. We can organize and plan these with you, ensuring that all needed expertise is available and on hand to safely guide the project. If you want to get your group involved in these or any other aspect of development work, just let us know and we can contact the organizations we work with and organize exactly the project you are looking for. "From the moment we stepped into Casa-Nica, we felt the welcoming vibe. From the handmade rocking chairs to the inside courtyard dappled in sunshine it was certain we could call this home. Josh, the heart and soul of this beautiful place, was so hospitable and a great tour guide to the beautiful city of Masaya and became a good friend to our group. Still topic to conversations months later, I know anyone of our group would go back to Casa-Nica." "I can’t even begin to express my gratitude for having you and Casa-Nica launch our trip here. I have enjoyed getting to know you and wish we had more time here. I could seriously stay here in Masaya with you for a while! Thank you for everything and please come visit us in Matagalpa! Mucho amor."